1. Driver´s must be older that 28 years. 2. Driving license must be “Class B” and to have been held for a minimum of 3 years . 3. Minimum rental period is 4 days and maximum is 45 days. 4. Rates include 21% VAT, national insurance and basic equipment. 5. Unlimited mileage for rental over 7 days. Rentals under 7 days has a max. of 200 km/day. 6. Comprehensive insurance is provided, with an excess of 600 €. breakdown and only provided if it is within Andalusia. 8. Pick up and drop off at Flamenco Campers base, unless otherwise agreed. booking confirmation. Balance due 25 days prior to pick up the vehicle. 10. Return delay will be charged as 60 €/hr + VAT, max. 480 € day + VAT. 11. Cancelation policy (check rental terms and conditions). 14. Smoking and lighting candles inside the vehicle is prohibited. permission on its terms and it will entail an additional cost. company FC. An international insurance extension is also required. 17. Travelling to Africa is not permitted. 18. Pick up and drop off vehicles on Saturday, Sunday or bank holiday has an additional cost. 19. Read all the “Rental Terms and Conditions” for a greater and more extensive information. 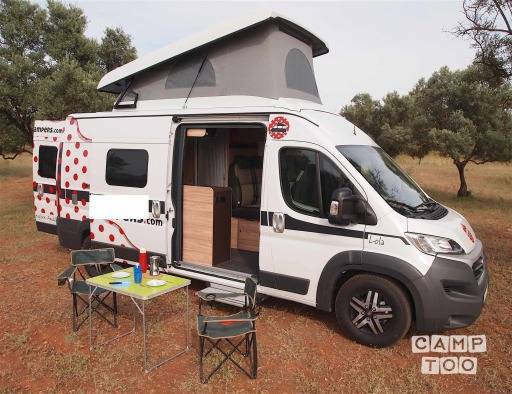 Je kan de camper ophalen in Alhaurín de la Torre bij Gonzalo. Je kan je auto hier gratis parkeren.